This started in 1968, but was a great family game in my home during the 1970s, It is so simple, and thus it was a great success, as all you had to do was to put plastic rods through a transparent container. Then you fill the container with marbles, and as the sticks or rods are filling the space, the marbles stay on top of them. The game really starts now, as everyone has to pull out a stick one at a time, trying not to be the stick that causes all the marbles to drop to the bottom of the container. It really was that simple, and it was so much fun for us in the 1970s. Perhaps we needed to get out more. Made by MB in the UK, it was advertised relentlessly in the 1970s on the TV. 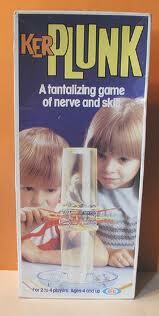 Not just the kids TV, but it was everywhere, and this cheap toy sold huge amounts, as it was deemed as a family game.